Motivation is one of the important thing during learning a foreign language. You have to do your best to learn or have contact with English every day. Firstly, try to listen to your favorite music in English and translate/understand the lyric. You can also watch a film with subtitles or read a book. When you have problems with speaking, find a friend on Skype or Facebook and practice your English in that way. 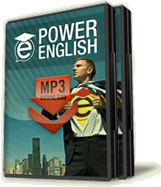 Click this link to learn more about Power English lessons! In Internet there are a lot of games or programs, which can help you during first steps. Entertainment and learning is the best, pleasant way to have a contact with English. This language is everywhere around us in advertisement, television etc. When you realize it, you will try to wonder, what it means and use dictionary to find that word, which you don’t understand. Maybe you have a friend, who also wants to speak English. You can learn together at home or take part in a language course. Be patient and the positive effects will come faster as you think. Thanks a lot about your system, AJ. My English's improved too much... you're a great teacher.! AJ, you are someone different!!! I love you. you are so powerful. I say to my English students that they need to enjoy the process of learning another language otherwise they will be just distracted and go elsewhere. Enjoy it as you would do your life! I'm a student from Laos. Frankly speaking, ever since i found out this useful site i gradually understood the methods how to get the most motivated way to learn english because learning through this wonderful site which i will never forget, cause it helped me a lot the very simply alternatives to learn english effectively and efficiency. Once again thanks to AJ Hoge the founder of created the Effortless English to all of us. Thanks to you Mr AJ!Uhm Pls add me in Skype this is my email romejes_47@yahoo.com. I want to improve my English speaking ability.tnx!